The ceremony for the Business Moneyfacts Awards 2019 was held a few days ago. FundInvoice were delighted to be confirmed as "Finalists" in the category of "Invoice Finance Broker of the Year". To be one of just ten brokerage companies across the UK, to make the finals for a national award is a big achievement for a small business like ours. The other categories that always interest us are the awards for "Best Factoring & Invoice Discounting Provider" and "Best Service From An Invoice Finance Provider". This is because there is some rigour behind these awards, as they require customers to provide testimonials. Therefore, they can contribute to the wider process of deciding which providers to introduce customers to. 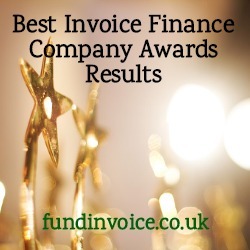 It is also good to see that we have connections with all those invoice finance companies that were recognised in these categories - you can use the links (to our contact pages) below if you want to send a quote request direct to any of these providers, via our site. Winner - Hitachi Capital Invoice Finance. Highly Commended - Close Brothers Invoice Finance. Commended - Bibby Financial Services. Winner - Close Brothers Invoice Finance. Commended - Investec Capital Solutions.